Ch Muhammad Iqbal son of Ch Sultan Ahmed was born on July 6, 1943 inIndia. He graduated in 1963 from Government College, Sheikhupura. 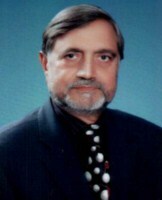 Anagriculturist, who consecutively served as Member, Provincial Assembly of the Punjab for six terms during 1985-88, 1988-90, 1990-93, 1993-96, 1997-99, 2002-07 and 2013-18; and also functioned as Minister for Revenue, Minister forIrrigation & Power, Minister for Information, Minister for Agriculture, Ministerfor Education, Minister for Food, Minister for Health, Special Assistant to Chief Minister, Member of Public Accounts Committee and Chairman Privilege Committee during these periods. He has returned to the Punjab Assembly for the eighth term in generalelections 2018. He has travelled to UK, USA and Iran on official visits and visited Malaysia during1996 to attend 42nd CPA Conference. Village Theri Sansi Railway Station, T&D Gujranwala.